We’ve been serving communities for almost a century. Learn more about the history of Graceworks Lutheran Services and our community involvement year-by-year. Click to open a PDF of a condensed, narrative history. A constitution is adopted on February 26 to facilitate cooperative inner mission work among congregations of the Joint Synod of Ohio (predecessor of the American Lutheran Church). An inner mission committee previously appointed at a mass meeting of Luther Leagues had prepared the constitution. In January, representatives at a joint inner mission meeting held at Hope Lutheran Church in Dayton, Ohio adopt a resolution to organize an inner mission society and call a pastor to be its superintendent. The Rev. Harry P. Long is called on May 3 as the first superintendent. He directs the inner mission work, which consists primarily of conducting worship services and Sunday Schools in various city, county and state institutions, as well as on inner city streets in Dayton, Ohio. Lutheran Inner Mission League of the Miami Valley is incorporated. Its stated purposes are to: (1) stimulate missionary activities and encourage works of mercy; and (2) bring Lutheran congregations together to (a) establish and maintain that inner mission work in Dayton and other places in the Miami Valley is feasible; (b) accumulate funds to establish operations on a larger scale; (c) receive, hold and disburse gifts, bequests and other funds; and (d) own and maintain suitable real estate and buildings. Congregations of the United Lutheran Church in America (predecessor of the Lutheran Church in America) accept the invitation to join congregations of the American Lutheran Church in the work of the Lutheran Inner Mission League. The Rev. Harold W. Foster is called as the second superintendent of the Lutheran Inner Mission League. He utilizes temporary offices at St. Paul Lutheran Church, Dayton, until space is leased at 19 North Perry Street in Dayton. Sister Marie Freese, a Lutheran deaconess, is called as director of the welfare department and installed on November 1. Except for a period between 1948 and 1954, she would remain employed by the organization in various capacities until her retirement in 1970. Operations were moved to a larger building leased at the corner of Montana Avenue and McClain Street in Dayton, where the Dayton Towers Apartments now stand. The building was purchased in 1938. During the winter and spring, in cooperation with other organizations, Lutheran Inner Mission League creates temporary headquarters to respond to Ohio River Valley floods. Over fifteen tons of clothing, food and furniture are distributed to flood victims. As a result, Lutheran congregations in Indiana and Kentucky begin to support the work of the Inner Mission League. Excess supplies from flood relief result in the creation of Lutheran Industries, a material assistance program that later included vocational training. This program would evolve into the establishment of Once Around Shop thrift stores in a variety of locations. Dr. Forrest R. Stoneburner begins his tenure as Superintendent (later Executive Director) and serves for 30 years. In his honor, a Stoneburner Employee Service Award would be established in 1981 to recognize employees who complete 10 or more years of service. The staff consists of six fulltime workers and one part-time worker, supported by hundreds of volunteers. The Lutheran Inner Mission League acquires a building at corner of Fourth and Commercial Streets in Dayton to serve as its headquarters known as the Lutheran Center. Building includes a gymnasium that supports youth programs, including basketball leagues for boys. The Lutheran Inner Mission League purchases a 100-acre farm with four houses to develop a home for the aged. The purchase price of $70,000 is borrowed entirely from the Winters National Bank and personally guaranteed by three Lutheran laymen. Lutheran Home for the Aged opens in one of the farmhouses and could accommodate up to 10 residents. Sister Marie Freese becomes matron of the new home. A second farmhouse is placed in service on the grounds of Lutheran Home for the Aged to accommodate up to 10 additional residents. 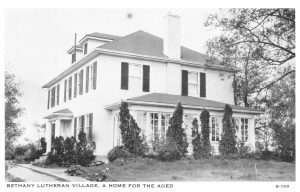 Lutheran Home for the Aged is renamed Bethany Lutheran Village. The name is chosen for Mary and Martha’s home in Bethany where Jesus received rest and renewal. Bethany Lutheran Village would grow to accommodate more than 700 residents in a variety of settings. Bethany Lutheran Village completes construction and dedicates its first building to accommodate 54 residents. Ohio Governor Frank J. Lausche responds to fervent appeals by supporters of the Lutheran Inner Mission League and changes the planned route of a proposed turnpike that would have bisected the Bethany Lutheran Village property diagonally from northeast to southwest. 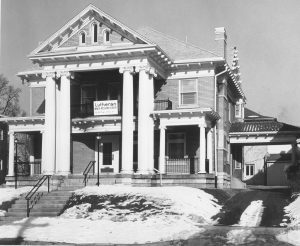 Lutheran Center is appropriated by the City of Dayton for urban renewal and part of the main Dayton Post Office is later constructed on the site. The organization moves its headquarters to a converted and remodeled house at 563 Superior Avenue in Dayton. The name of the Lutheran Inner Mission League of the Miami Valley is changed to The Lutheran Social Service of the Miami Valley. Bethany Lutheran Village completes the addition of east and west wings to the original building, creating a capacity for 216 residents. The Lutheran Social Service of the Miami Valley becomes a licensed adoption agency, ending the practice since the 1940s of coordinating adoptions with other Lutheran agencies. Pregnancy counseling also develops as an integral service. Congregations of The Lutheran Church – Missouri Synod becomes associated with the work of The Lutheran Social Service of the Miami Valley. After the retirement of Dr. Stoneburner, the Rev. Nelson W. Trout is named as Executive Director of the organization. Family and counseling services are provided for the first time in the Cincinnati area, with a social worker providing service one day each week at the former Lutheran Church of the Cross, 2350 Ravine Street, Cincinnati. The first cluster of 29 Cottages at Bethany Lutheran Village is constructed. A total of 162 Cottage units would be developed in multiple phases through 1999. An 11-story residential high-rise building, now known as Vista Place, is completed on the campus of Bethany Lutheran Village. The Rev. Randell E. Tonn is appointed as Executive Director of the organization. During the fall, in response to an energy crisis, The Lutheran Social Service of the Miami Valley abandons its headquarters on Superior Avenue and moves into the ground floor of the Tower at Bethany Lutheran Village. A Cincinnati office is opened in leased space near the Tri-County Mall and staffed with a fulltime social worker to provide counseling and adoption services. In response to national legal trends and liability issues, the delegate body adopts a new set of governance documents, which shifts central authority that had been previously shared with congregational delegates and committees to the Board of Trustees. Dennis Bruce is named as Executive Director of the organization. The Lutheran Social Service of the Miami Valley begins to administer the Consumer Credit Counseling Service debt management program offered by the former Lutheran Community Services of Springfield, Ohio, and then extends the program to Dayton. The first We-Care Homes group home is opened in Cincinnati for individuals with developmental disabilities. We-Care Homes now serves more than 180 people in a variety of settings throughout southwest Ohio. The HandiVan transportation service for elderly and disabled persons is established in Miami County, Ohio, based at Zion Lutheran Church in Tipp City. In collaboration with community volunteers and local congregations, a Once Around Shop is opened in Eaton, Ohio, housing the Preble County Human Needs Center. The name of The Lutheran Social Service of the Miami Valley is changed to Lutheran Social Services of the Miami Valley. Major renovation of the Health Care Center at Bethany Lutheran Village is completed, including the addition of the Main Street common areas, new kitchen and dining areas, mechanical upgrades, and general redecorating. “The Pillar of Faith”, a religious sculpture by Robert Koepnick, is installed within the new entrance lobby of the Health Care Center. First Manors of the Valley apartment facility (Martin Luther Manor, Dayton) is completed for elderly and disabled residents with limited resources. Manors of the Valley would grow to serve more than 700 people at 18 locations in southwest Ohio, southeast Indiana and northern Kentucky. The Evangelical Lutheran Church in America (ELCA) commences as the result of a merger of the American Lutheran Church, Lutheran Church in America, and the Association of Evangelical Lutheran Churches. Lutheran Social Services of the Miami Valley becomes an affiliated agency of the ELCA and continues its status as a recognized service organization of The Lutheran Church – Missouri Synod. In response to dramatic growth in the breadth and scope of services, the ministries of Lutheran Social Services are reorganized into four primary divisions, with an administrator in charge of each division reporting to the Executive Director, plus a fifth division for administrative support. As part of reorganization, Bill Serr is appointed Deputy Executive Director and General Counsel. A new office building in the Cincinnati suburb of Springdale is completed as a permanent home for social service programs in the Cincinnati area and a headquarters for We Care Homes. The Pavilion at Bethany Lutheran Village, a 40-unit licensed assisted living facility, is opened during the autumn. The Homestead apartments for independent living are completed at Bethany Lutheran Village. More than 1,000 persons tour the facility at a July open house preceding a dedication that includes unveiling of the “Spiral of Life” sculpture by internationally acclaimed Stephen Canneto. Lutheran Social Services moves its central administrative functions and personnel into a newly constructed Executive Office building on the campus of Bethany Lutheran Village. Congregations from Clermont and Hamilton Counties in Ohio co-sponsor the opening of the Once Around Thrift Shop in Amelia. Bethany Lutheran Village achieves first accreditation by the Continuing Care Accreditation Commission (CCAC). The Health Care Center at Bethany Lutheran Village is renamed the Linden House upon completion of a 196-bed all private room addition. The Bethany Rehabilitation Center begins to provide short-term rehabilitation and therapy for persons who have been discharged from hospitals. Bill Serr is named as Executive Director (later President and Chief Executive Officer). The Council on Accreditation of Services for Families and Children (COA) accredits Lutheran Social Services of the Miami Valley for the first time. In response to federal welfare reform, the Learn to Earn program is created to provide job training and work experience for individuals transitioning away from welfare. After spring floods in the Ohio River Valley, Lutheran Social Services of the Miami Valley coordinates Lutheran Disaster Response efforts that helps more than 1,000 families rebuild homes and reorient lives. Bethany Lutheran Village achieves first accreditation in long-term, subacute and dementia care from the Joint Commission on Accreditation of Healthcare Organizations (JCAHO). The Care Team Ministry program is organized to help congregations provide second family support for families and individuals in need. Lutheran Social Services of the Miami Valley becomes a charter member of Lutheran Services in America, a newly created alliance of the Evangelical Lutheran Church in America, The Lutheran Church – Missouri Synod, and 280 Lutheran social ministry organizations across the United States. Lutheran Social Services of the Miami Valley is chosen as one of five Lutheran social ministry organizations to implement a Senior Companion Program under a grant received through Lutheran Services in America from the Corporation for National and Community Service. Lutheran Social Services is honored by Lutheran Services in America with the National Award of Excellence for Senior Volunteerism. We-Care Homes earns first-time accreditation by the Commission on Accreditation of Rehabilitation Facilities (CARF). The Dayton area material services program is transitioned into the Outreach Connections program (originally called the Lutheran Resource Exchange), which matches individuals’ and families’ emergency and ongoing needs with services provided by congregations and other community organizations. Congregational delegates adopt amended governance documents that establish affirmative covenants of support as a prerequisite for congregational membership. The new governance documents clarify qualifications and duties of members of the Board of Directors and for the first time allow the election of qualified non-Lutheran Board members, provided that a majority of the Board consists at all times of members of Lutheran congregations. A new name for the organization, Lutheran Social Services of Mid-America, takes effect at the beginning of the year. This name is more inclusive of all the communities served by the organization in southwest Ohio, southeast Indiana and northern Kentucky. The title of Executive Director is changed to President and Chief Executive Officer, and five Vice-Presidents are appointed as part of a reorganization that groups all residential programs under a single Vice-President, Operations, and all community-based services under the Vice-President, Mission Integration and Community Outreach. The staff consists of 850 full- and part-time employees, providing the full-time service equivalency of 746 employees supported by the efforts of more than 1,000 volunteers who provide 93,000 hours of service annually. More than 50 residential and program locations are supported with annual budgeted expenses of more than $48 million. The organization’s new name, Graceworks Lutheran Services, became effective in January 2006 and expresses a motivation to offer works in faithful response to God’s grace. The name captures the organization’s Lutheran heritage and conveys the rich meaning associated with its work. Graceworks Lutheran Services’ corporate office is located on the 100-acre Bethany Village campus in Centerville, Ohio. Graceworks deploys a $47 million expansion project from 2006 through 2009 that enlarges and transforms Bethany Village, one of Ohio’s most respected Continuing Care Retirement Communities. During 2007, the most robust construction year of the expansion project, Graceworks generates $232 million in economic impact for the Dayton area and tri-state region. Graceworks Lutheran Services launched Graceworks at Home in early 2010. The home health company started on the Bethany Village campus as a way to help residents recover in their own homes after a stay in the hospital or Bethany Rehabilitation Center while receiving care from familiar faces. Since 2010, Graceworks at Home has expanded to provide in-home services to individuals living in many southern Ohio counties. Graceworks at Home is a Medicare-certified home care agency. In addition to skilled medical care, occupational and physical therapy, Graceworks at Home also provides non-medical support in the form of daily living assistance, meal preparation, laundry services, companionship and more. Bethany Village revamps oldest cottage neighborhood, razes 12 homes and rebuilds nine new Grand Cottages. The Bethany Rehabilitation Center (BRC) undergoes a major gym expansion, providing over 5,000 sq. ft. of space. Occupational therapy receives a dedicated space as well. Graceworks Housing Services opens a new home in Forest Park Cincinnati to better serve residents. Consumer Credit Counseling Service and the Senior Companion Program move to new offices. CCCS moves into the new Goodwill Easter Seals building on North Main Street in Dayton, creating a strong partnership. Senior Companion also teams us with Goodwill Easter Seals, moving to their Kuntz Road location in Dayton. Graceworks Enhanced Living opens its first Day Program in Dayton, leasing 6,000 square feet downtown, near 5/3 Field ballpark. Bethany Village announces plans to build Crescent Crossing, a modern approach to assisted living. The planned expansion will add 74 assisted living suites to campus, plus a gathering space with chapel and dining area. The 90,000 square foot project will cost an estimated $42 million and be complete by late 2018. We’re proud of our history. Would you like to know more? We’d be happy to speak with you. Please contact us.